Welcome to the Domicil Hotel in Frankfurt, your hotel in downtown Frankfurt, near central station and Frankfurt Trade Fair! Stay at this Frankfurt hotel in Germany ideally situated near Frankfurt’s banking district! Stay in our centrally located hotel in the middle of the financial district within easy reach of the Frankfurt trade fair and the convention center. The S-Bahn S 8 and S 9 take a few minutes to reach the airport Frankfurt Rhein Main. Discover Frankfurt’s places of interest and the “Zeil” shopping promenade on foot. Frankfurt central station is 200 meters away and provides connections to local and long-distance trains, S-Bahn trains, subways, trams and busses. If you come by car, leave it conveniently and safely in the „Westendparkhaus” (subject to charges) 100 meters away. The guarded parking garage is open 24 hours. Feel at ease in one of our guest rooms in the standard- and comfort class. All rooms offer free Wi-Fi internet access and soundproof windows. Floors in different colors provide more variety. The high-quality comfort rooms have additionally a safe and air conditioning. 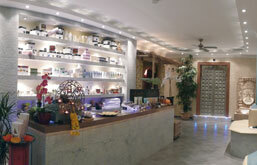 DEHOGA classified the Favored Hotel Domicil as 3-star-hotel. Try our delicious breakfast buffet in our bright and nicely decorated breakfast room. Coffee and tea are available free of charge at the front desk all day long. Join our new bonus programme. Your loyalty is rewarded.